Exciting times are ahead for Arma 3 and it's upcoming developments + DLC. I thought I'd make a post consolidating some of this information for the community to read (and for those that don't always follow Arma's news updates). As we can see from the image above, feedback tracker changes and stability/optimisation is top of BI's list for updates. Considering it's been about 9 months since release (and over a year since the Alpha), I can't help but think "it's about damn time". Either way, this is good news for everyone - maybe one day we'll be able to hold out a firefight in Kavala (Altis) with more than just 2 Klawces! Before we start discussing what each DLC will bring, I just want to make a note of BI's "features are free, premium content is paid" philosophy. This means that any features released in DLCs and updates will be free for everyone. The content, however, will still be a paid premium. With that said, BI has come up with an interesting way to split the divide between those that have DLC, and those that don't. In short, all DLC will essentially be free for everyone (including content). 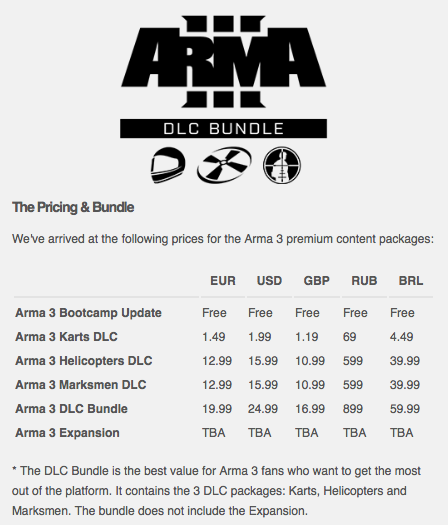 DLC won't be compressed or offer 'lite' versions (like in Arma 2), but instead everyone will have all content at its highest quality. If you were silly enough to spend the money on the Supporter Edition (like me), you'll also get access to the Expansion without surcharge. Also, unlike in Arma 2: Operation Arrowhead, the Expansion won't be a standalone game - it will build on top of Arma 3. Along with flight models, the Helicopters DLC will also bring logistics (Sling Loading) and the ability to Fire from Vehicles (yes, you heard me right). Both features are apparently engine based and will of course be completely MP-compatible. Maybe we'll also be able to walk around inside some of these new vehicles while in-flight? We haven't been told many specifics yet, but it seems that the Marksmen DLC will overhaul some of the shooting mechanics and make it much more challenging to fire a weapon. I guess we can hope for proper wind ballistics and the ability to adjust your weapon's scope to counter for windage, but this is pure speculation. In other news it looks like there has been a lot of development on Arma 3's AI. A lot of work is underway on the dev branch, but some of these improvements have already been pushed to the stable build. In fact, Frosty and I found out that our public server hasn't actually been running bCombat or any other AI mods. Although we did think the AI were a bit 'different', we had no idea that we were up against vanilla AI. We will be putting bCombat back on for now, but perhaps in the future we might be able to run our servers without any AI mods. Well, that about raps up this update. I may do more of these in the future (for significant developments such as Arma 3 news, mod news, or even RL army-related news) when I get more time and depending on what people think. So what they should have fixed in the first place is now a DLC? Makes sense. Pretty much. But the good news is it will all be free (bloody right too!). In terms of stability, don't forget how long it took Arma 2 to get itself into a decent state. I know that doesn't make up for BI completely taking the p*ss, but at least we have something to go by. It is all pretty vague so far. Here is a quote from Boehima about that. When the Helicopter DLC comes out and you dont own it, you might not be able to actually fly it as a pilot and only as a passenger. To be fair I dont really see how the system they want to usw is going to look, or how it is going to work. Some further updates and info in the link about bootcamp﻿.